Perfect for marking and dating your documents the 5440 is a self-inking rubber stamp. The Professional range of self-inking rubber stamps is extremely reliable due to its robust metal framework, yet light due to its outer plastic casing. 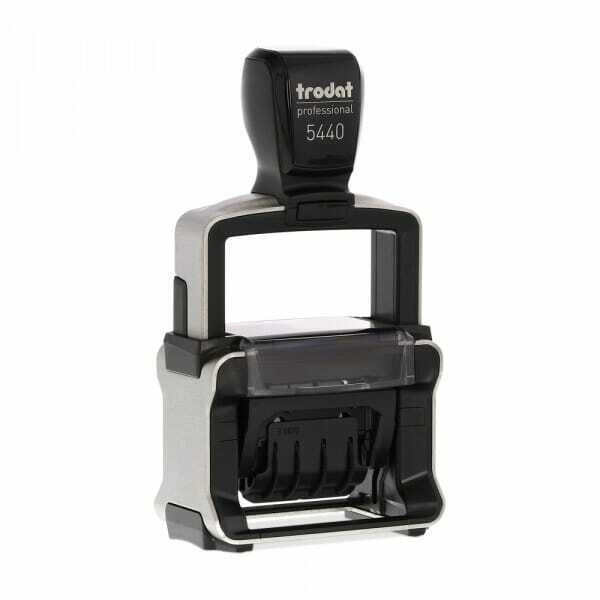 The Trodat Professional 5440 can include up to 4 lines of customized text, above and below the date. The date band includes month (in letters) day and 12 consecutive years in figures. The impression size of the stamp is 1-1/8" x 2" (28 x 49 mm). The date is easily set by turning the date bands, creating an impression of blue text and red date. Although if you require an impression of any other color the 6/53 compatible ink pads are available in the following colors: black, blue, green, red, or violet. Produced climate-neutral with maximum possible use of recycled plastic and compensation of unavoidable CO2 footprint by investment in climate protection projects. Customer evaluation "Trodat Professional Dater 5440 1-1/8" x 2" - 2+2 lines"
BEST Customer Service!!! Great product, it is PERFECT!!! !